Feed mill mixer, also called feed mill mixing machine, widely used for mixing raw materials like corn, wheat, soybean, grass, potato, rice, oil meal etc in animal feed production. According to working principle, it can be divided into two, horizontal type and vertical type. Horizontal feed mill mixer is composed of machine body, rotator, discharging hole and transmission part, adopting the principle of inner and outer ribbon pushing the raw materials to each other part. 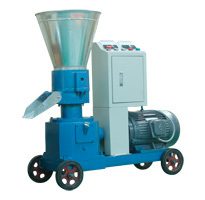 Horizontal feed mill mixing machine can not only process the loose raw material but also can process the raw materials with high large adhesion. It can mix 1000kg of raw materials (as corn) per hour with the time of 3-5 minutes every bunch. Vertical feed mill mixer adopts working principle of two asymmetric spirals inside of the mixer lifting raw material with the rotation in axis to the top of the machine, meanwhile the tumbler rotates slowly in different rotation direction, thus mixing the raw materials fully. 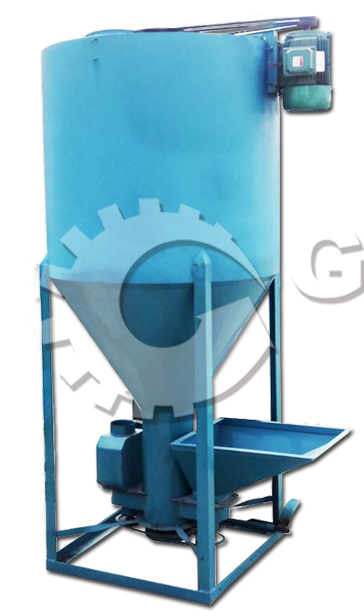 Vertical feed mixer is composed of charging barrel, inner sleeve, motor, vertical spin and belt wheel etc, covering a small area, especially suitable for mixing the powder raw materials in small feed production. 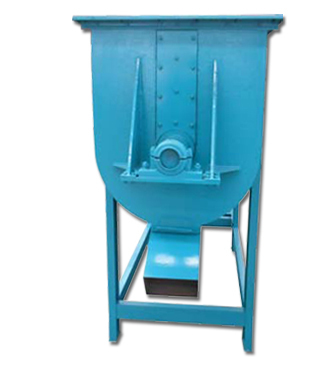 This feed mill mixer can be connected to the grinding machine for powder feed directly to mixing the powder feed without pelleting processing. 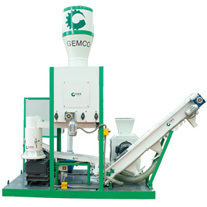 In small feed mill plant, feed mixer is used for mixing the raw materials which is from crushing processing, providing prepared raw materials for next pelleting processing. 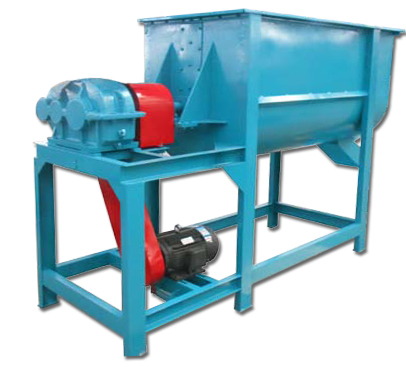 Feed mixer is suitable for making animal feed in medium and small feed mill plant, individual aquatic farm, livestock farm and poultry farm etc. As we all know that feed production means a series of processing, including raw feed material preparation and feed pelleting processing these two big parts. Preparation of raw feed material is closely related to the final feed pellet quality, as one part of raw feed material preparation, feed material premix is very important in small feed mill. 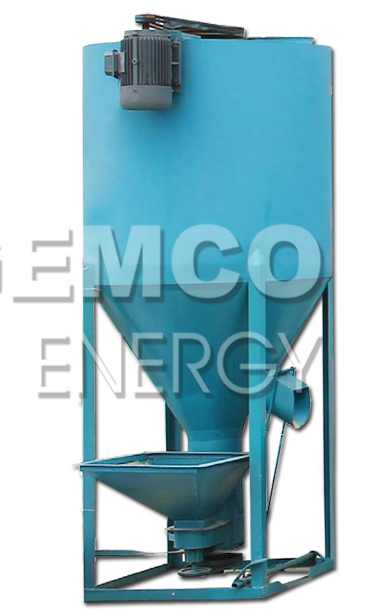 During the mixing processing, you can put all the raw materials needed for animal nutrition into the feed mill mixing machine. And other necessary materials, such as, mineral element like calcium, phosphorus, sodium, potassium etc, micro element like Iron, fluorine, smash, copper, molybdenum etc and vitamin agents etc can also be added. 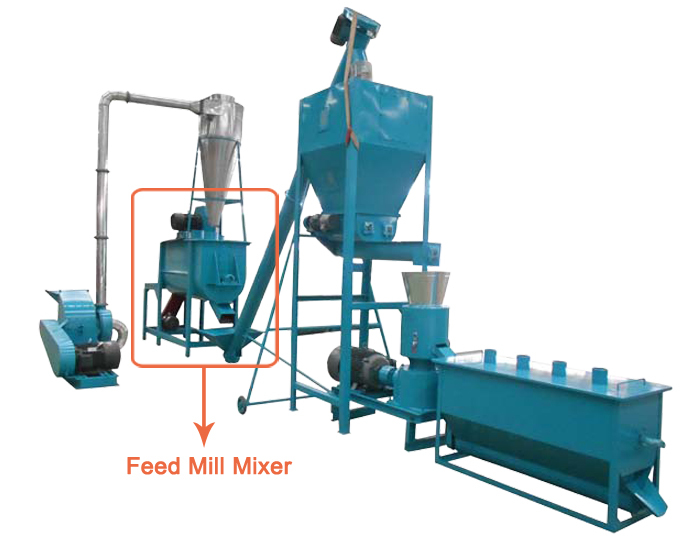 Why Choose Feed Mill Mixer? Imbalanced nutrition; low feed conversion ratio; poor digestion; bad feed palatability; finally causing animals’ slow growing, decreased immunity, finally resulting high animal death and culling rate. To solve these problems, it is necessary to equip feed mill mixer.